Small and verdant green, this 'Spice Isle' really does smell delicious. But it's not just spices that this paradise produces a bounty of, it's also dripping with fruit and flowers - it's won numerous Gold Medals at the Chelsea Flower Show. And, of course, it's full of wonderful beaches. Most of Grenada's visitors head for the island's south, near the pretty capital, St. Georges, where you can find both the best places to stay on Grenada and the best beaches. St. Georges' natural horseshoe shaped harbour is one of the most stunning in the Caribbean, and today is lined with shops, cafes and restaurants etc. Beyond the harbour, the town rises along narrow streets onto several little hills, so there are plenty of beautiful views to be discovered. As you might imagine, St. Georges also has some excellent markets. Aside from St. Georges, and the stunning surrounding beaches, most of Grenada is pretty under-developed as far as tourism is concerned. But it is well worth taking a drive into the gorgeous green hills just to smell the air, to see the local fruit and spice farms and to experience the vibrant local culture. Grenada's natural attractions include some exceptionally picturesque waterfalls, several gardens, and even more beaches, bays and coves. Divers and snorkellers will also find much to interest them below the waves. Whilst the island boasts many beaches, we'd recommend in particular Grad Anse, with it's long sweep of white sand and turquoise waters. Go diving to check out the many man-made underwater sculptures - a pretty cool experience all in all! Try to go on a clear day though as rain can affect the visibility. Hike through luscious forestal surroundings to visit the Seven Sisters Falls, one of the most beautiful waterfalls on the island and with a pool that's perfect for enjoying a refreshing dip. History buffs should go visit Fort George and Fort Frederick to learn more about the island's past, both of which also boast wonderful views of the area. Off Grenada's coast are its little islands, pretty Carriacou and extremely local, and dozy, Petite Martinique, as well as the really tiny ones. 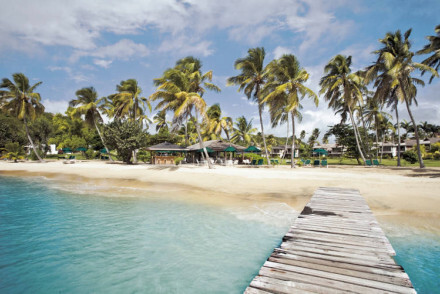 However, our pick of the best places to stay in Grenada are all situated on the main island. The Calabash Hotel offers thirty suites worth of every luxury you can imagine, from sea views, to private pools, to award-winning cuisine, to a top of the range spa. And the beach won't let you down either. Utter perfection. 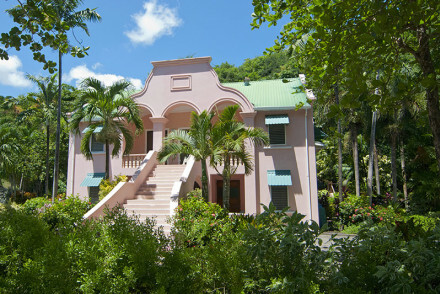 La Sagesse Nature Resort is a charming 12 room hotel, snuggled right up against one of Grenada's most pristine beaches. There's a beachfront restaurant to help you take full advantage of the beauty of your surroundings, and the choice of rooms, with suites and cottages sleeping up to four, mean it's a comfortable spot for families. Affordable, comfortable and family friendly, the Blue Horizons Garden Resort offers some of the best value accommodation on Grenada, with an enormous pool, children's playground, extensive gardens and a great local restaurant. 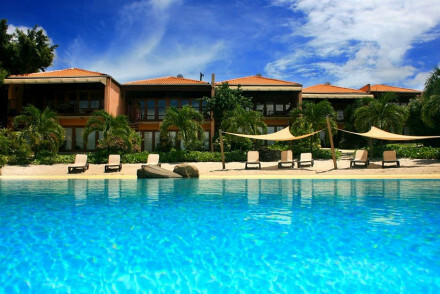 The True Blue Bay Resort is also one of the best places to stay in Grenada if you're here with the family. Set just back from the marina, it offers chic beach rooms, suites and two bed villas. Great for sailing and watersports, they also have an excellent Caribbean restaurant. Mount Cinnamon is a boutique beachside spot offering one and two bedroom villas, the latter of which are perfect for families. The accommodation is stylish and features plenty of colourful artwork, whilst there's also a spa, a restaurant and a pool. 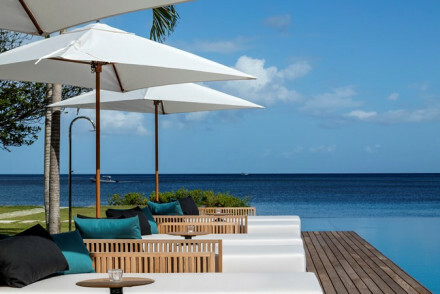 Laluna is probably one of the best places to stay in Grenada if you're here for a special occasion. Its 16 luxury cottages offer minimalist perfection, including private pools and personalised spa treatments. The Italian restaurant is a surprise, but it really works. 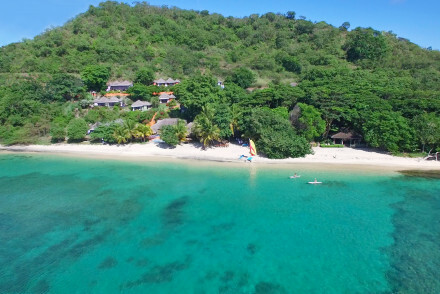 The Spice Island Beach Resort is an all-inclusive, tropical paradise stunner, with every facility you can imagine you might need and then some more! The 4* Maca Bana offers stylish one and two bedroom villas with their own kitchenettes. Boasting stunning sea views, the property also features a large pool and a fine dining restaurant. A wonderful all round stay. If you'd prefer a self-catering option then browse through the wide variety available online with our partner, Booking.com. Grenada is warm year round, though June to November is the rainy season (with the possibility of hurricanes) so it's best to avoid visiting at this time. If you want decent weather but to avoid the winter peak season then consider coming in April or May. International visitors can fly into Maurice Bishop International Airport, located on the southwest tip of the island. There are no direct flights from the UK so you'll need to changeover at least once, with the total journey time usually amounting to 11 hours or more. Browse through our list of all the best places to stay on Grenada. For a wider range of properties check out all our Caribbean recommendations. A charming hotel on one of the best beaches in Grenada. Untouched sand and tropical plantation as soon as you walk out of your room. Basic rooms, suites, and cottages (sleep four) are good value. Beachfront restaurant serving local & international cuisine. Cheap, family friendly, secluded. 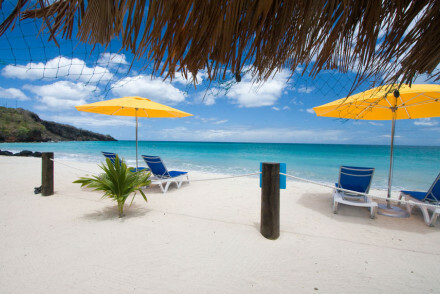 Beach nearby - La Sagesse beach is one of the most idyllic in Grenada. Back to Nature - Rooms have no TV's, radios, DVD players or phones. Affordable, very comfortable, and family friendly. A charming hotel with excellent facilities including an enormous pool, excellent fine dining restaurant serving International West Indies cuisine, children's playground, and beautiful grounds full of indigenous birds. Value chic - One of the more affordable places in Grenada. A fun boutique hotel located just a stone's throw from the marina. Beach chic rooms, suites, and two-bedroom villas have kitchenettes, balconies, and all the mod cons. Excellent Caribbean restaurant, large pool, and immediate access to sailing and watersports. Watersports - Set on the marina the hotel has excellent access to waterports and sailing. Families - There are some club villas with two bedrooms. A tropical paradise with Five Stars and every amenity you can think of. Thirty suites, some with private pools, have sea views, balconies, and romantic furnishings. Award-winning cuisine by celebrity chef Gary Rhodes, top of the range spa, private white sand beach, cabanas, tennis courts. Honeymoons - A tropical paradise with everything you'll need, all in heightened luxury. Foodies - Award-winning cuisine by Gary Rhodes. Spa breaks - Luxurious 'Heaven and Earth' spa. A bright boutique villa-style resort with one and two-bedroom accommodations. Stylish rooms and suites decorated to perfection have DVD players, balconies, and kitchenettes. Relaxation therapies in the spa, pool, stunning views, Clubhouse restaurant and Beach Cabana. Fabulous. 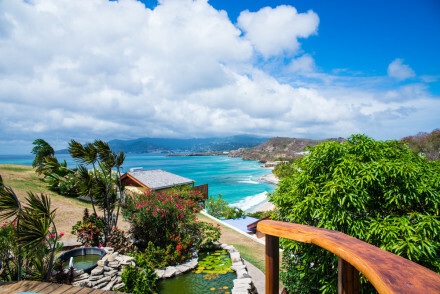 Views - Wonderful views over Grand Anse Beach and out to the Caribbean Sea. 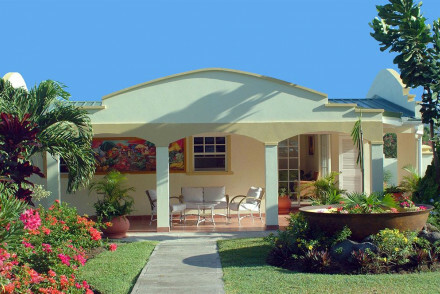 Families - Two-bedroom villas are ideal for families. Spa - Facials and beauty treatments. An excellent four star option with sumptuous one and two-bedroom villas. Traditional elegance and classical furnishings in the rooms. Private kitchenettes and living areas. Stunning sea views, large pool, and a fine dining restaurant. Luxurious, romantic, and family friendly. Intimate beachside boutique hotel. Designed in minimal Balinese style, sixteen luxury cottages come with private pools and all the mod cons. Fabulous Italian restaurant uses Italian produce, a top of the range spa and therapeutic treatments, yoga centre, and blue blue sea to swim in. Foodies - Fresh food and wine imported from Italy. 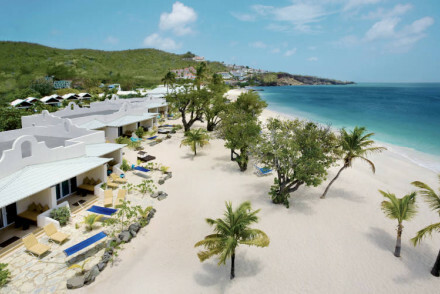 A dazzling new resort oozing sophistication on Grand Anse beach. Designed by Paris-based architects AW2, each detail has been lovingly and painstakingly thought out, and it was worth it! Interiors are clever and paired down, the restaurants are excellent and the pool is the longest in the Caribbean. Other Activities - Check out the state of the art gym and the 100m infinity pool- getting fit never looked so good! A stunning beachfront all inclusive resort with luxurious cabanas right on the beach. A tropical paradise with two restaurants, tennis courts, pools, suites with pools, diving school, and a kid's club. An idyllic spot with lots of facilities and plenty of pampering. Beach Life - Directly on a white sand beach, it's the perfect spot. Honeymoons - Stunning interior design in sumptuous suites.